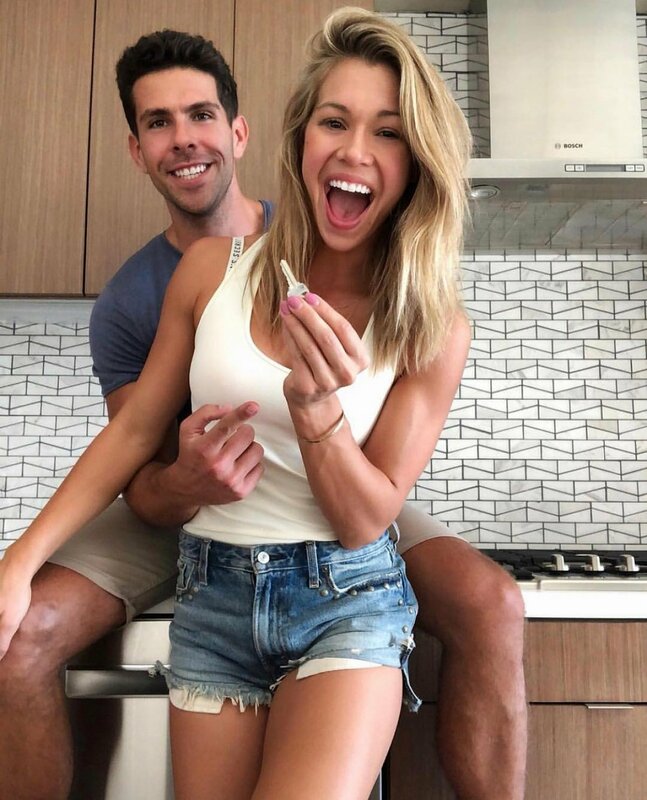 Bachelor in Paradise couple Krystal Nielson and Chris Randone are taking their relationship to the next level by moving in together! The couple announced the big news on Sunday by sharing a series of photos on Instagram of their new home in San Diego, CA. In one photo, Krystal was smiling big and holding out the key to their new place, as Chris held her from behind. "It's official!! We're moving in TOGETHER!!!!" Krystal captioned the photos. And on Chris' Instagram page, he wrote alongside the same photos, "In the words of all my boys back home.... Let's Goooo Babyyyyyy. It's OFFICIAL we're APPROVED for our first place together! Excited for this new chapter! Now we need furniture to put into this amazing place!" Last month, Chris, a 30-year-old sales trainer, said he hoped to be living under the same roof as Krystal by November 1; however, it was unclear at the time which city in California they were going to settle down in. Chris and Krystal fell in love on Bachelor in Paradise's fifth season this past summer. The season ended with Chris getting down on one knee and proposing marriage to Krystal, and during the show's reunion special, Chris cried because of how happy he was to have a woman like Krystal in his life. "I see a beach and bare feet," Krystal told People when asked about her vision for their future wedding. "And lots of crystals!" Prior to getting involved on Bachelor in Paradise, Krystal was a villain on Arie Luyendyk Jr.'s season of The Bachelor and Chris made waves on Becca Kufrin's season of The Bachelorette. "I was very thick-skinned and hard-shelled when I got to Paradise," Chris told People. "I was not myself. I was trying to act like this tough guy, that I had an ego." Chris and Krystal not only left Bachelor in Paradise with each other, but they also managed to alter their reputations and rehab their images for the better. "She knew, based on conversations we had had, that I was a genuine guy with a good heart," Chris revealed. "So she pulled me aside and said, 'You need to be more self-aware or you're going to lose friendships here and you're going to lose me.' I realized that this woman came out of nowhere to give me direction." Chris told the magazine Krystal spoke to him from the heart that day. "I realized that if I don't change now and be vulnerable, I'm going to lose this incredible woman," Chris recalled. Krystal, a 32-year-old fitness instructor from San Diego, remembered being "hard-skinned" going into Paradise as well because they had both gone through tough times. Each person, for instance, grew up without a father and was raised by a single mom. "We bonded over that. I could understand him," Krystal noted. "I truly believe everything happens for a reason. Everything I went through on The Bachelor and Bachelor in Paradise led me to develop and grow into my own as a person and eventually, it led me to Chris."